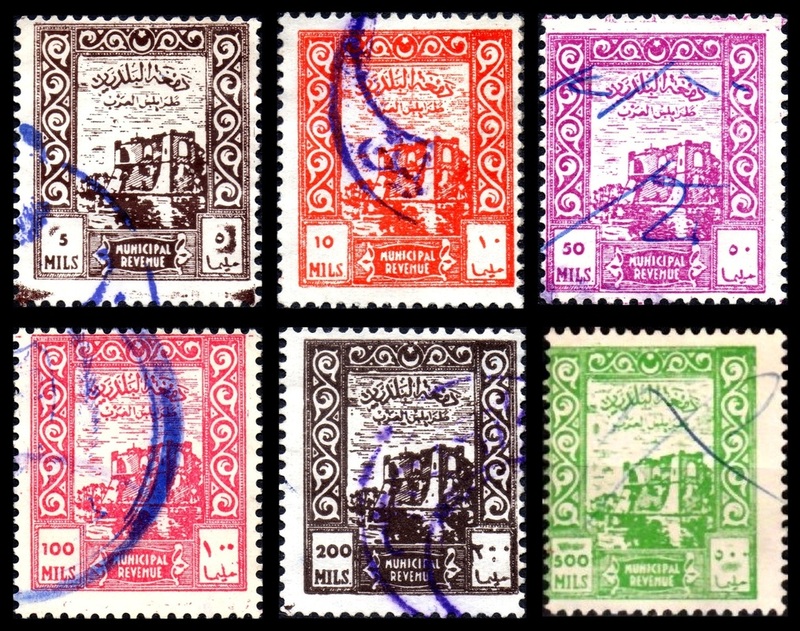 The revenue stamps of Libya since independence are difficult to get to grips with, for a number of reasons. Most significant among these is the fact that the inscriptions on the stamps often give little clue as to the purpose for which they were issued. Also different sets sometimes seem to have been used concurrently, making it hard to determine with certainty in what sequence they were issued. The sequence of issues in the Libya section of this website is therefore subject to revision as more information becomes available. 1952 (recorded usage January to May). Key type featuring Tajura Mosque, east Tripoli. Inscribed REVENUE in English and Tax Department of Tripolitania at foot in Arabic. 24½ x 30 mm. Perf 11½ (line). No watermark. Currency in MAL (=Military Administration Lire). Figures of value in black. 1. In addition to the values listed above, Erler lists the 12l and 100l but I have not seen these. 2. The Military Administration Lira was in use for only a few months after Libyan independence, from 24 December 1951 until early in 1952. This issue therefore probably saw quite brief usage. 1952-56 (recorded usage). As previous issue but currency in MILS. Figures of value in black as before. Sheets of 50 (5 rows of 10). 1. Erler records two different shades each of the 5m, 10m, 40m and 100m. 1954 (earliest recorded usage). As previous issue but figures of value in same colour as rest of design. MILS in capitals on all values except 1000m (inscribed 1000 Mils). No watermark. Perf 11½. Erler additionally lists a 25m from this series, though I have only seen this perf 13½ (see T117 below). Barefoot lists a 250m violet and 500m blue, but I have not seen either of these. Erler also records two different shades each of the 1m, 5m and 15m. 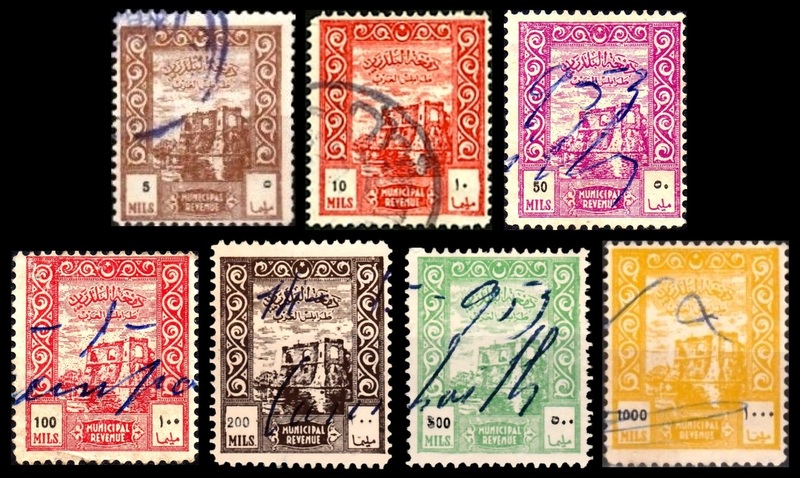 For similar stamps but without REVENUE in English, and with a different Arabic inscription at foot, see Kingdom federal issues #61ff. 1959 (earliest recorded usage). As previous issue but rough perf 13½. 1954-61 (recorded usage). Al-saraya al-hamra (Red Castle), Tripoli. Inscribed MUNICIPAL REVENUE in English and Municipal Revenue Tripolitania at top in Arabic. Perf 11½. No watermark. c1952. 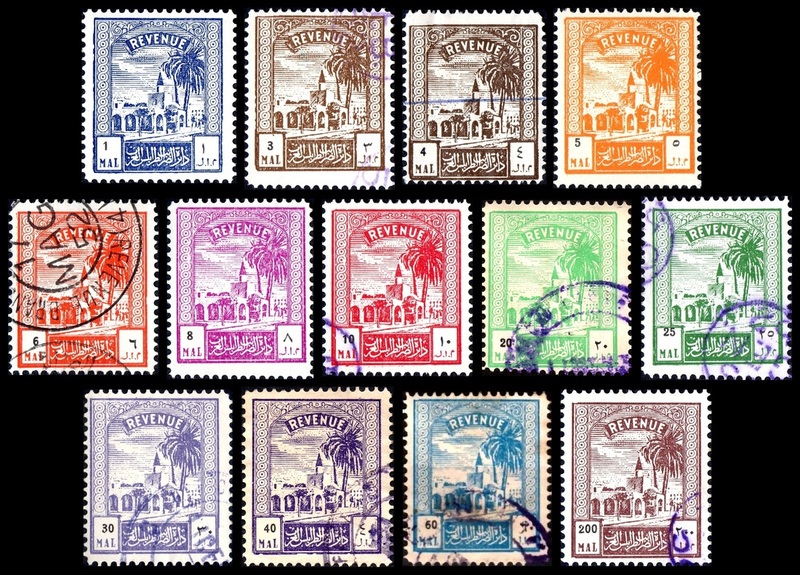 1952 Tajura Mosque issue of Tripolitania overprinted Burqah (=Cyrenaica) diagonally in Arabic. Barefoot does not list these stamps, but he does list the following thirteen stamps with this overprint but denominated in MAL, none of which I have seen: 1, 3, 4, 5, 8, 10, 12, 25, 30, 40, 60, 100, 200 MAL. Note: the dates of issue for the next two sets are derived from the material in the Davies collection of Libya Revenues ex the Bradbury Wilkinson archive, which is housed in the British Library. Dates and requisition numbers of individual printings are footnoted below each set listing, though print quantities are not known at present since the Davies material does not record them. 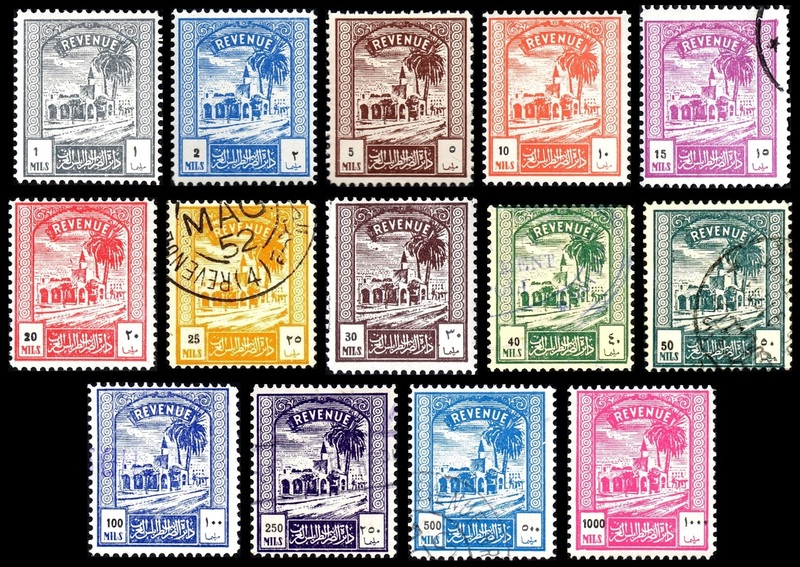 Stamps which are known from the Davies collection but have not been seen as issued stamps are listed in square brackets. 1955-57. New type showing the Atiq Mosque in Benghazi, inscribed Government of Cyrenaica at top and Department of Revenues at foot in Arabic. 27 x 32 mm. Perf 11½. No watermark. Printed (recess) by Bradbury Wilkinson. 1955-63. Similar to previous issue but featuring the old Town Hall of Benghazi in central vignette. Inscribed Government of Cyrenaica at top and Department of Revenues at foot in Arabic. Perf 11½. No watermark. Printed (recess) by Bradbury Wilkinson. For similar type but with altered Arabic inscriptions, see Kingdom federal issues #81ff. The inscriptions on this and the previous issue are identical, with no indication as to how they were used. However the fact that they were issued simultaneously may suggest that they did in fact serve different revenue purposes. The design of a town hall building on C51/59 might indicate that these stamps were used for a municipal tax. 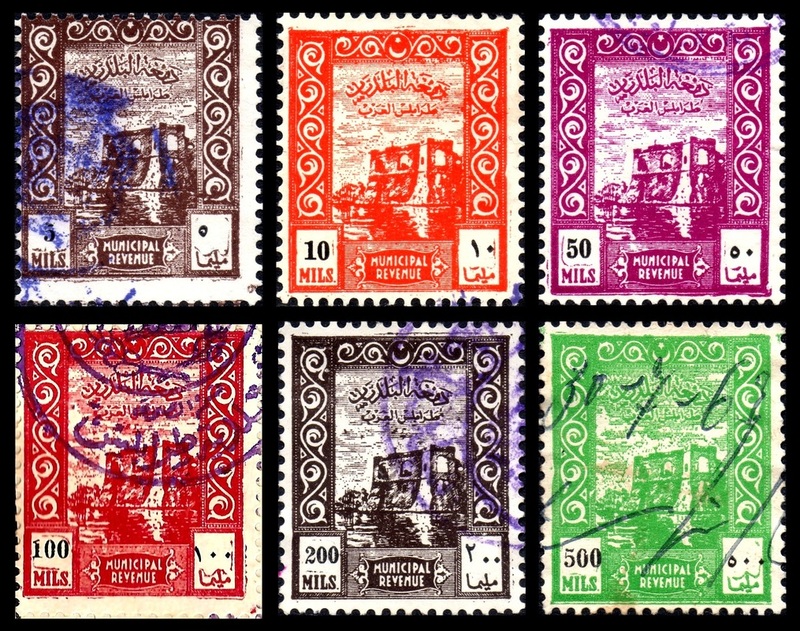 I am very grateful to Peter Bradford for identifying the buildings illustrated on these stamps and other issues of Libya. c1955. Atiq Mosque type similar to C41 etc but printed directly onto lined paper for documentary use. Inscribed Government of Cyrenaica at top and Department of Revenues at foot in Arabic. 27 x 32 mm. Presumed printed by Bradbury Wilkinson. The illustration below shows the top portion of a complete paper bearing an impression of P2. 1950s? Desert scene with camel rider, 38½ x 18½ mm. Perf 11½. No watermark. ​1. Duston lists a 10m red as F1/2 (though this may be an error for my F8) and a 50m lilac-brown, which I have not seen. ​2. 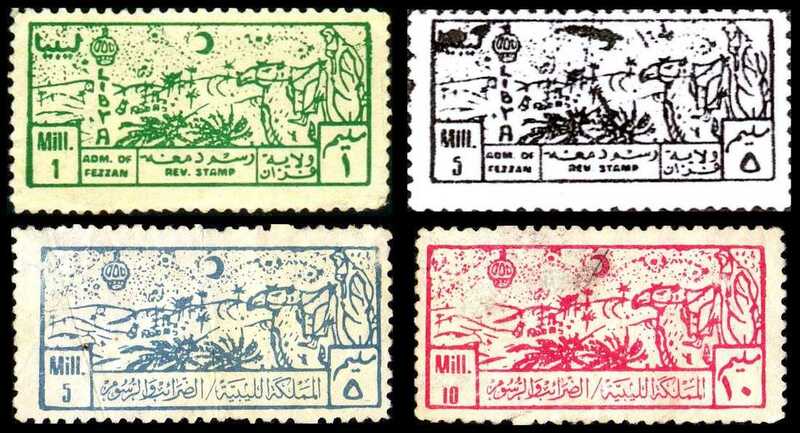 The inscription on F7/8 implies that these stamps were valid for use throughout Libya but I list them with Fezzan due to their similarity to the regional issues. 1950s? Inscribed FEZZAN Impot du Timbre.